Baxter complained to her Company that performance evaluation forms illegally coded for age, race, and gender. She also objected to the Company reneging on an extension of about 15 to 30 days on her FMLA leave. Within 2 hours of her protest of being required to return to work earlier than the agreed on leave, she received a call from a Human Resources officer that the Company had eliminated her position. Genworth’s first defense to a jury trial was an Arbitration Agreement. Baxter’s employer, Genworth, demanded that Baxter follow the dispute resolution procedure set out in its employee policies manual. Baxter refused. Genworth filed a motion to compel arbitration. The arbitration agreement, as described by the trial court, was permeated with unconscionability. This legalese is another way of saying the Agreement was garbage, and not to be enforced. Maybe the Company used this Arbitration Agreement just because it could, and hoped not to be challenged. Or perhaps the Arbitration Agreement had been drafted by counsel in another jurisdiction, somehow unaware of California’s limits on one-sided agreements. But this particular Arbitration Agreement practically begged to be challenged, and so it was, successfully, in the case of Baxter v. Genworth North America Corporation (October 30, 2017) in an opinion by the California First Appellate District, Division 3, Contra Costa County. 1. The Agreement limited discovery to two depositions, ten interrogatories, and five document production requests. 2. The Agreement unilaterally limited Baxter but not Genworth from contacting any co-employees about the subject of her claims. 4. 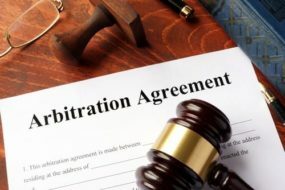 The Arbitration Agreement gave the Arbitrator discretion to enlarge the scope of discovery upon a showing of “good cause.” This requirement of good cause was greater than the less severe “showing of need” that Courts had allowed in earlier reported cases. 5. The Arbitration Agreement allowed for the Arbitrator to enlarge the scope of discovery. But the Court of Appeal held that while there is a presumption Arbitrator discretion will be exercised reasonably, allowing the Arbitrator to rule on the issue of unconscionability is itself unconscionable. Likewise, the court held, citing Pinela v. Neiman Marcus Group, Inc. (2015) 238 Cal.App.4th 227, 254, that an arbitration agreement allowing an Arbitrator to rule on extending the scope of discovery is inherently unconscionable. 6. The Court also cited as unfair and unenforceable the employer’s attempt to limit the conduct of the arbitration to two 8-hour days. The Court reasoned that employment cases are complex, and this limit unduly limited the likely time to prove the elements of the case. 7. In the context of the limitations analysis, the Court strongly implied that the employer mandated internal dispute procedure unfairly shortened the time for bringing of claims as a condition of proceeding to Arbitration. The process, found in a handbook, provided for four levels of claim administration. Each step in the internal claim resolution process required the employee to act within 15 or 30 days of the Employer’s response. The Arbitration Agreement Could Not Bypass Unconscionability with an Escape Clause. In conclusion, when reading provisions with limits on discovery or time to file, do not assume that an arbitrator’s discretion to enlarge the time or scope of these restrictions will save the agreement. To the contrary, they will not. Another lesson, supported by other cases, is that in balance, a great deal of procedural unconscionability [such as severe limits of discovery and time to file] will compensate for a small amount of substantive unconscionability [such as lack of bargaining power and duress to sign the Agreement]. This last point is important because the law requires a court to find both substantive and procedural unconscionability to deny a motion to compel arbitration. For more information about arbitration agreement enforceability generally, see Waiving Arbitration.